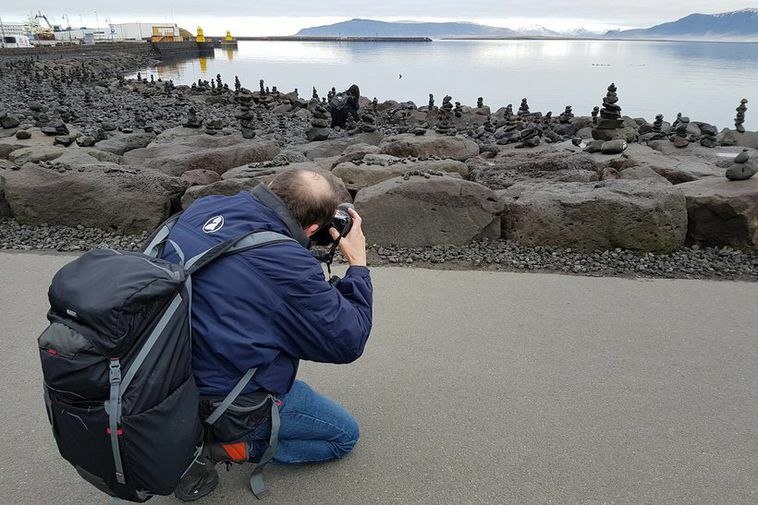 Cairns, man-made piles of stones have been making a rapid appearance on the shoreline below Harpa concert hall and conference centre at the heart of Reykjavik. Tourists began building them on Tuesday and since then they're multiplying very fast. This was noted by Einar Páll Svavarsson who wrote a post on Facebook site Bakland Ferðaþjónustunnar with the accompanying photograph. "I walk past Harpa every day and in the past few days I've spotted tourists building cairns constantly. There are over three hundred cairns there now. I suppose these are tourists who have finished their Golden Circle tour, Northern Lights tour, Whale Watching tour and are now looking to create their very own tourist attraction. " He adds that when other tourists spot tourists building the cairns they all start taking selfies with the cairns. Two years ago, tourists were mad about building cairns at Þingvellir, but local farmers tore them down.